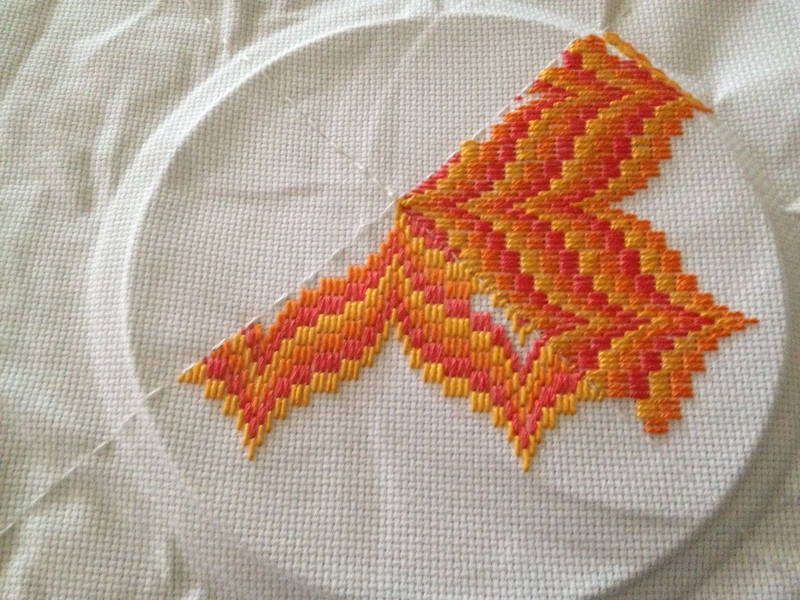 Lately I’ve become enamoured with Bargello embroidery. We’ve all seen the Jonathan Adler pillows, but it was a post on Retro Renovation that really sparked my interest. For me, personally, it seems silly to buy them (vintage or otherwise) when I used to teach embroidery classes & am fully capable of making them. It is a technique traditionally done with wool thread on needlepoint fabric, but I have not sought out a proper needlepoint store around here to get supplies so for my first (trial) project I’m just using 14 count AIDA cross-stitch cloth & DMC pearl cotton #5/regular DMC embroidery floss, I’m using a #28 tapestry needle because it has the largest eye (pearl cotton is a pain to thread onto needles) & bluntest tip of all of the embroidery needles I happen to have lying about. 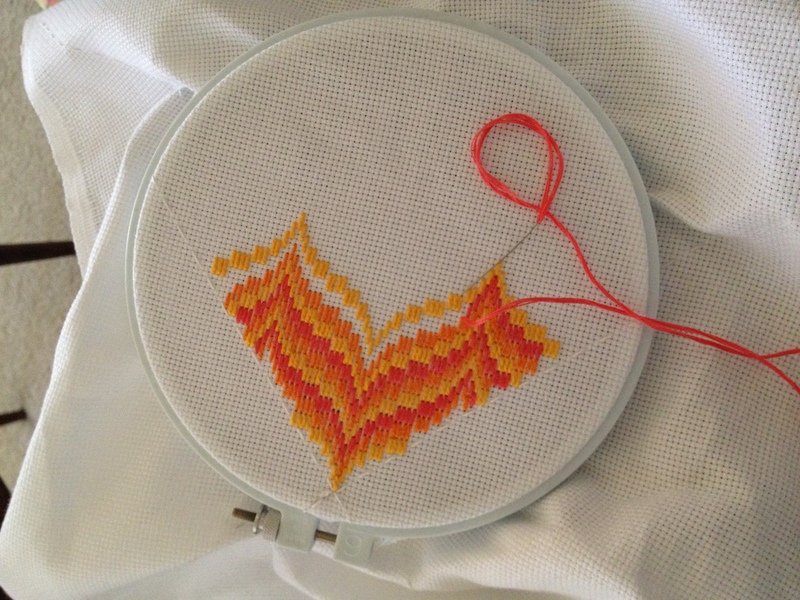 I wanted to make a pillow that has the same colors as my teardrop string art, so I’ve used the same embroidery floss. 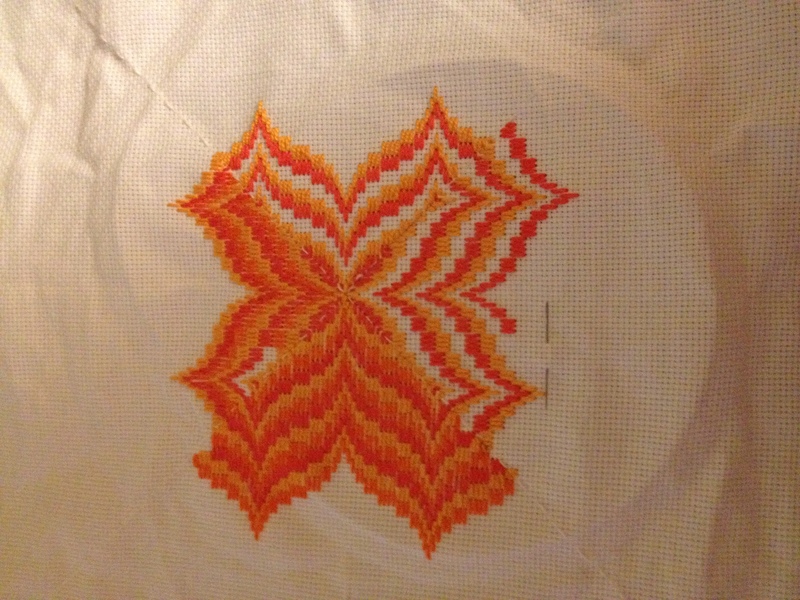 I’ve decided to do a 4-way pattern, as I like the way the center of these look when done. I divided the fabric into 4 quadrants & marked them off with a running stitch of white DMC pearl cotton #8 (should have chosen a much thinner dark thread since I’ll be pulling it out at the end anyway, but this was what was within arm’s reach when I started). I’d love to tell you where I got the pattern, but I didn’t really get a pattern so much as looked online at a bunch of pics & decided what to do based on that. You can see the number of stitches used to create the flame pattern pretty clearly on the photos though if you want to try it. I’ll post the finished pillow when I’m done…but I’ve caught the baking bug lately and have been neglecting my crafts, so it may be awhile.